Samplesource Spring 2017 Free Sampler Packs are coming soon! All you need to know about when they go live and how to get them is below! When are Samplesource packs available? - Samplesource has Free Sampler Packs twice a year for their members, one in the spring and one in the fall. Who gets the Samplesource sampler packs? - You need to be a Samplesource member (which is free) to get them. Be sure to sign up if you haven't yet. When does Samplesource go live? - They do not reveal when exactly sampler packs go live, but they do provide sneak peeks on their Instagram account that I share with my readers on this blog as soon as they become available. Once they go through all the sneak peeks the sampler packs go live shortly after that. I am a member, why do I never get samples? - Being a Samplesource does not mean that you automatically get sampler packs, you have to order them yourself every single time. Please note, samples are limited so you gotta be online and order when they are live. Why do I only get a small number of samples while others get many? - How many samples and which ones you get depends on how you respond to the survey when ordering samples, as well as demographics and how many samples are left at the time of ordering. They try to match what samples you get to the needs that you express. There are supposed to be over 22 different samples from amazing brands this spring to Try Before You Buy. In the past, if you answered "Other" to the questions you were offered the most amount of samples, but this isn't necessarily proven and I suggest that you answer honestly. Also, if you say that you currently use a brand, odds are that you won't be offered a sample for that particular brand as are looking for new customers/testers for that particular brand/product. I order Samplesource sampler packs but they never arrive? - If you ordered and your order was valid you would of got an email that your order was shipped and you can also track the status in your Samplesource account, so there is no confusion about whether you got it or not. There is a limit of 1 per household, so perhaps you ordered more than one and so it was cancelled. I recommend contacting Samplesource if you do not receive them and you did order. 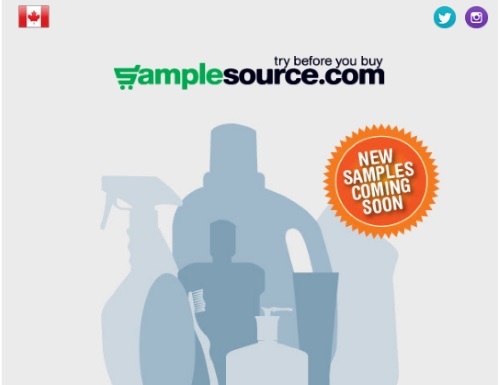 I never know when Samplesource goes live and when I try they are always sold out - Samplesource sends an email to their members once sampler packs are live, but this is often hours after they've already gone live and some samples are already out. Be sure to keep up with our social media and blog to see them live when they first go live. Any other questions? Please write a comment below so that I can respond! Stay tuned to our social media networks and this blog, I post as soon as there are any updates. The moment that sampler packs go live I post on our Facebook Page and Twitter to let everyone know, be sure to follow us on there to get notified right away. Click here to see the first Samplesource Sneak Peek.